Sandland Adventures invites you to join us for a whole day of fun at the Oregon Dunes. View an impressive natural wonder of endless shifting sand, unique tree islands, wildlife and the spectacular Siuslaw River. Pick an exhilarating dune ride on our Sand Rails or a relaxing tour on our Giant Dune Buggies. Our professional drivers will show you a great time while you traverse across miles of dunes. Our 1 hour dunes tours also include traveling down our Pacific Ocean beach. Large or small groups can be accommodated on either tour. 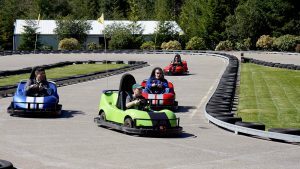 After your dune ride, you can have fun bumping and splashing on our Bumper Boats, race on our Grand Prix style Go-Kart track, play our Miniature Golf Course or take a ride on the Cloverline Railroad. Note to our visitors Sandland Adventures coupons and specials can change without notice. So please visit their official website to make sure of the latest pricing and coupons.